I generally don’t blog on Saturdays, as it’s kind of nice to have a day to relax and not slip into writing “a short blog post” that actually eats up an hour or two of my day. Mind you, I love writing the blog! It’s just important to have a day off to recharge my batteries. But I certainly walk my walk, even when I’m not writing. I woke around 9 A.M., and put on the kettle for my morning tea. Although I like coffee, I know the cost of a Red Rose tea bag is 3.5¢, and how it’s important to not indulge expensive habits. Two cups of tea spread an hour or so apart gives me the perfectly calibrated caffeine jolt. Energetic, but with money in my bank account. I then sat down at the computer to answer e-mails, respond to threads on The Non-Consumer Advocate Facebook group, while also clicking around Swagbucks for a bit. I see that someone has replied to a Craigslist post about two thrifted mirrors that I’m selling, so I arrange to have her come by the house around 10 A.M. I scramble up a couple of eggs in my cast iron pan, content in the knowledge that I’ve made good use of the six cartons of $1.25 loss leader eggs from a few weeks earlier. I cram gently place a load of laundry in the wash, knowing today is forecasted to be hot. Perfect Oregon day to hang towels on the clothesline. Yes, they’ll be crunchy, but I try to use my electric dryer as little as possible, especially in the summer. I then take a few minutes to photograph my vintage canning jars that I pulled from a free pile the day before. I’d already washed them in the dishwasher, so they’re all sparkly and perfect. I quickly write up a Craigslist ad, which I expect I’ll relist a few time before they sell. This doesn’t bother me, as it’s but the work of a moment to relist something on Craigslist. It’s free so I have no cause for complaint. 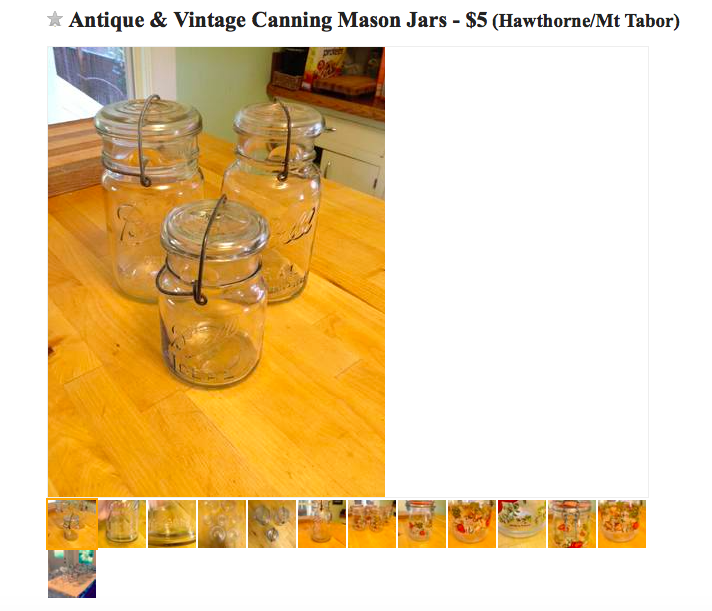 I do choose to keep a few of the jars. I shower and putter around the house and hang towels on the clothesline and cloth napkins on my Ikea clothes rack. I also read a library book for an hour or so. I then take a pair of sturdy old folding chairs that I’d snatched from the same free pile over to my local consignment shop. Although it’s only three blocks from the house, I get lazy and throw them in the back of the Prius. (They’re pretty heavy.) It’ll take fifteen minutes or so to get them appraised, so I drive back home. My kids are now up and hungry, so I ask them if they’d like some pancakes. (My husband bought a gallon of milk not knowing that I’d bought some the day before, so I’m thinking about how pancakes use two cups of milk.) My older son requests cornmeal pancakes, and I tell him I’ll do my best. We only have a 1/4-cup of cornmeal, so I combine two recipes to create a cornmeal-whole wheat pancake hybrid. Of course, they are delicious. I set a jug of syrup upside down on the table to use up the last of one container before starting a new one. I also set out a jar of homemade strawberry jam that turned out super runny. I refer to it as “strawberry syrup.” My hollow-legged teenage sons eat every last pancake and are served milk to drink. 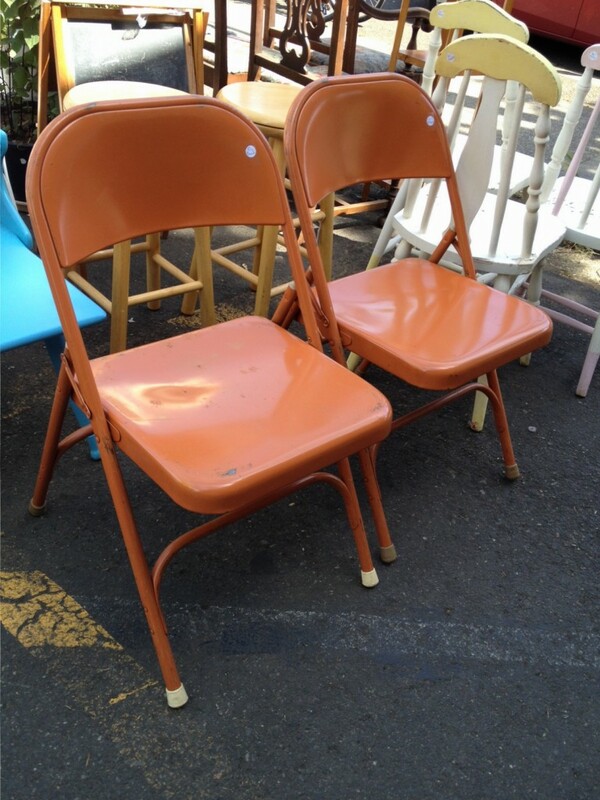 I walk over to the consignment shop and notice that my folding chairs are already set out and priced at $10 apiece. I walk inside and am handed $6 in cash. I decline getting a larger amount in store credit. I need less stuff, not more! I’m 100% okay with the profit that the shop takes with the sale. They have expenses, and I want them to stay in business. I gather up any library books that are coming due, as well as a few I know I’ll never read and I walk out in the opposite direction. I’ve already preloaded a Clark Howard podcast on my iPhone4, so I’m good to go. I return the books and browse the DVD’s and blu-rays. I notice that they have a blu-ray of Birdman, which I think is funny. (New releases usually take a few months to hit the shelves, as they have long hold lists.) I guess I’m not the only one who thought this movie was awful. I choose one DVD and head out. I walk a few blocks over to Fred Meyer for groceries. I’m distracted by a garage sale, but since I have no cash in my wallet, that temptation is weak. 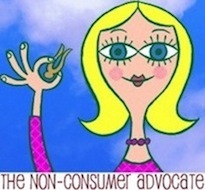 I grab a basket at the grocery store and buy lettuce, tortillas, sour cream and a bottle of Kraft barbecue sauce. I’d loaded a coupon onto my loyalty card for the sauce, which made it free. It can sit in my pantry or be donated to the food bank at some point. I walk a different route home, which is my habit, as it increases my chances of coming across something interesting. This pays off when I come across another tasty free pile. I help myself to a bamboo rice server, a rubber spatula, a stainless steel one-cup measure, a plastic bag of small paper bags and a perfect looking lamp complete with lampshade and fussy finial. I’m excited about about each of these finds. The rice server will replace the plastic one we’ve been using. (I hate using plastic with food.) the rubber spatula will flesh out the one we already have, as it seems I always end up fishing it out of the dishwasher to wash by hand. (I guess I use the rubber spatula more often than I run the dishwasher.) The one-cup measure can live in my flour bin, and the paper bags can be used for making non-toxic microwave popcorn. And the lamp? I’ll take it to the consignment store. Neighbors walk past as I crouch in front of the free stuff, and we chat for a bit. I putter around the house some more and unclip the laundry from the line. The towels are perfectly crispy and smell like heaven. I chat with my neighbors who just installed their own clothesline. I comment about how cute their daughter’s tiny socks are. I heat up some leftover rice and beans and warm the tortillas in the cast iron skillet. I grate cheese, chop lettuce, snip cilantro and put out salsa and the sour cream. I take the lettuce-washing water and dump it on outside plants. “Dinner’s ready!” I call, and everyone comes to assemble their own burritos. My husband’s at work, so it’s just us chickens. My younger son decides that he’d rather hang out with his friends and play the last indoor soccer futsal game of the season than go to The Timbers game, so my husband sells his ticket. This nets us $22. My plan had been to drop him off and come home since he had two back-to-back games, but I start to chat with other parents and ended up staying the entire time. This turns out to be a good decision, as my son scores eleven goals! We don’t get home until 10 P.M., at which point showers are taken and relaxation begins. I pop a couple bowls of bulk purchased popcorn using the new paper bags. It’s such a hit that we end up eating probably eight bowls of popcorn between the three of us. I add a squirt of honey to the melted butter for a sweet treat. We then spread a greasy and sticky film all over the house. I take a nighttime stroll to the first free pile, as I’d noticed that it looked freshly stocked. There’s a gorgeous vintage twin bed frame, but it smells strongly of cigarettes. I know I could scrub it down, but I’m not feeling up for a project so I leave it for some other industrious Portlander. 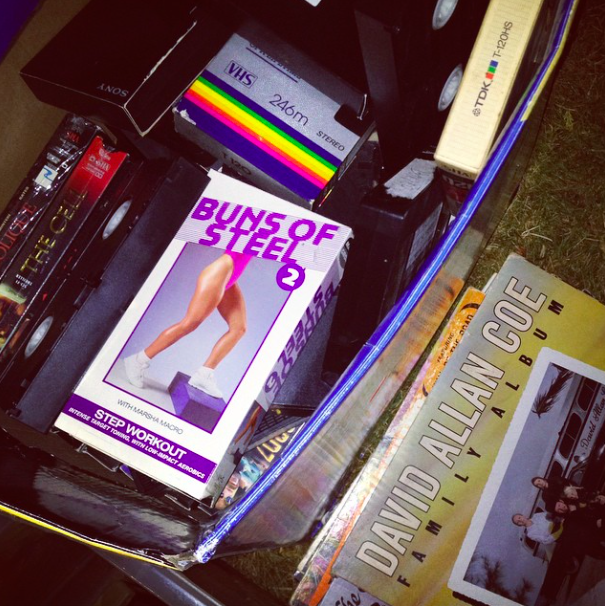 There’s a box of videos that includes Buns of Steel 2. I wonder about the cigarette-smoking-steel-bunned person who lived in this house. I come home and browse through the cable TV options to see if anything looks tempting, but end up choosing Netflix and my old standby, Buffy The Vampire Slayer. I watch one episode and then fall asleep during the second one. My day is done. This day was pretty typical for me, except that I did no writing. I made a few dollars, cooked from scratch, shuttled kids around and puttered around the house. I didn’t spend any money beyond the four dollars at the grocery store. sounds like my sunday! Too hot to do much in the garden, so while the laundry flaps away in the hot wind, I’m going through my third bedroom. Mind you, it can’t really be called that as there is no bed. It is a room with my computer, a million or so books, candles, houseplants (the only room in that end of the house with direct light}. Also 30+ years of pictures that I mean to put in albums. Basically anything that needs a home goes in this room. So I’ve been cleaning, sorting for a garage sale and it’s looking better. And no money was spent today! Sounds like you had a perfect day. It’s broiling hot today, so I spent the day indoors cooking, tidying, and finding some stuff to trade-in to Amazon for more gift card money. Packaging materials will cost nothing, since I’ll be reusing a big Tyvek envelope from my old job and some unprinted newspaper sheets that the Salvation Army used to wrap some china I bought last week. You must have air conditioning if “indoors cooking” is a hot day activity! We do. Summer is nearly unbearable in south Tennessee without it. But it’s been a cool summer up until this weekend, so we’ve rarely had to turn it on. Ahhh . . . southern Tennessee. That explains it! My husband bought a portable air conditioner for our bedroom two years ago, we’ve been able to go without the rest of my life. Although the couple of years that I lived in NYC were brutal! Sounds like a great day. I like the idea of drinking tea instead of coffee. I mean to try that. For several years we have sold things on Craigs List and have met people at our home, always outside with garage door & shades drawn – no peeking at our other stuff. Now, one of the local police/fire stations is offering to the public a place to meet to sell items from Craig’s List, eBay or want ads. It is in the lobby where it is well lit, has video and, of course, police/firemen on duty at all hours. Now we may just put some jewelry up for sale knowing we have a safe place to meet someone. As we too are reducing our belongings we avoid at all costs going by yard sales. Lucky for us, due to our HOA rules, free items cannot be set at the curb. If they were allowed we’d be right on them – for resale purposes. We too are getting rid of a number of expensive items and our local police encourage Craigslist buyers & sellers to meet at the station. We are very happy they promote this as our area is known for craigslist crime. Once we are done with this last (hopefully) sale, most of my basement & spare bedrooms will be pretty empty after both kids moved out and moved out of the state. This will make it easier for us to move closer to the kids when we retire. That is so cool! I wish we had a safe place to meet people from Craigslist. I love this post! Its like your five frugal things times five. We also have crunchy towels here. When my mother-in-law comes over and sees laundry on the line she wrinkles her nose and says she hates stiff clothes. I figure not running our dryer saves 50 cents a load (since our loads are big and we bought our dryer used ten years ago) plus whatever money its saves from running our AC less. Wow on those folding chairs. My cousin just had a garage sale this weekend and sold 12 of the same kind for only $2 each. She should have charged more if the consignment store can get$10. 🙂 Sounds like you had an awesome frugal weekend. I rarely see free piles around my neighborhood. My neighborhood is amazing for free piles!!! I love days like this- house and neighborhood puttering are some of my favorite things to do! Yesterday I made from scratch pancakes for breakfast. After doing some laundry in cold water, we attended a free concert in our local park- we walked there ( for exercise and gas savings). My son and husband played frisbee in the yard while I read my library book. Dinner was pulled pork in the crockpot, roasted potatoes, and a big salad- all of which I had in my at home stash. That sounds like such a great day! My frugal win of the day? The building inspector finally came to check our newly installed furnace/AC and told us the company was supposed to install a carbo monoxide detector. He said he’d notify them this week and they’d probably come out in a few days. Instead, I called the company myself and they came out today already and installed it, free of charge. And I won’t have to hang around waiting for them the rest of the week and can go to work. I guess we had a puttering weekend as well. Hubby is getting over a cold and did not have a lot of energy. We walked to 7-11 to pick-up a free Red Box rental. I listed items on Freecycle and got rid of some stuff. Even though it takes more time than going to the thrift store, and there is no tax break, I still like giving stuff away in this way. Meals were leftovers or simple to fix foods. I am working on a charity toddler sweater. I am branching out and using a couple of partial skeins. I looked at some examples on Ravelry. It is a great site for those that knit and/or crochet (and of course I use the free patterns). Love Red Rose tea as well. I used to have the Buns of Steel tapes – as I recall I got a very good workout but the frequent lunges hurt my knees after a while. I now walk, garden and do yoga – much more sensible for this over 50 Nurse! Just a hint about the crunchy towels – Often towels get crunchy when they’re line-dried because there’s too much detergent. Depending on your water that may or may not be an issue; but I noticed with our towels when I started using only half the recommended detergent, they came out much softer and not at all crunchy (and they’re still just as clean). I already use a very small scoop, but I’d sure to happy to use less! Next post: When Life Hands You Strawberries . . .